Summerland Beach is a hidden California treasure! Nestled between Carpinteria and Montecito, Summerland Beach is a charming stretch of sand that sits just below Overlook park in Summerland, California. 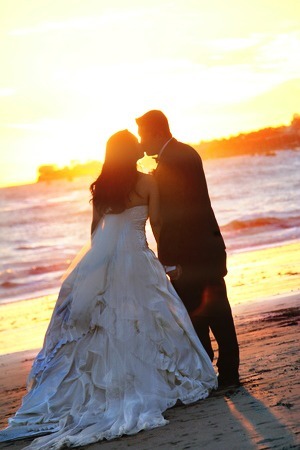 Sunsets at Summerland Beach are spectacular and can definitely be the perfect Santa Barbara venue for you. Just steps above the beach at Overlook Park you will find expansive grassy areas, public restroom facilities, and a children’s playground which makes it a great location for your wedding reception as well. Parking in the lot is free but not abundant, alternate parking is on the street as you enter the park. Once in a while you will see ranch hands exercising horses on the beach. Also, dolphins love this beach and seen on a regular basis. Directions: exit 101 at Evan’s Ave. in Summerland. Drive towards ocean, across railroad tracks. Butterfly Beach, located across the street from The Four Seasons Biltmore in Montecito is a locals favorite. Butterfly Beach is ideal for sunset or early wedding ceremonies as it does draw a strong local crowd between 11am to 4pm. Montecito’s Butterfly Beach is one of the few west facing beaches along the Santa Barbara coastline which makes for spectacular sunset views over the water. It’s also the place to be for dolphin watching, which often can be seen playing in the surf in the early to late afternoon. Because it is not a very wide beach, please check the tide charts http://saltwatertides.com/dynamic.dir/californiasites.html before considering this venue for your wedding celebration. Directions: Take the 101 to Olive Mill Road in Montecito (a few minutes south of Santa Barbara). At the stop sign, turn towards the ocean (away from the mountains) and follow it a quarter of a mile along the coast. Butterfly Beach is on your left. Parking is limited and will be packed with cars on most weekends. Park on either side of the street along the beach or drive up Butterfly Rd and park in the nearby neighborhoods. East Beach is in front of some of the largest hotels in Santa Barbara. This vast beach is ideal for wedding set ups as the tides are rarely an issue. Note: This beach may require a set up permit especially on the weekends. Located just below Shoreline Park, Sandy Cove Beach is Santa Barbara’s hidden seaside treasure. Boasting dramatic rugged cliffs and secluded coves, Sandy Cove beach is ideal for couples looking for some privacy as you will experience very little to no foot traffic. Please note that the 80 steps that lead down to the sand, this beach does not lend itself to those with ambulatory issues, is not conducive to chair or arbor set ups, and ideal for low to mid-tide conditions. Directions: From the 101 take Garden and turn away from the mountains. Garden will dead-end onto Cabrillo Blvd. Turn right and follow the road for about a mile. Continue past the harbor and at the top of the hill you will see Shoreline park on your left. Follow the narrow wooden stairs directly beneath the pagoda-like entryway to the beach below.